The 12th annual Muddy Trails Bash will take place on Saturday, April 6, 2019, at Rob Flemming Park from 3 to 8 p.m. 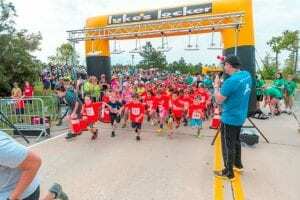 Produced by The Woodlands Township Parks and Recreation Department, the USA Track and Field (USATF) sanctioned event features chip-timed 5K and 10K trail runs, the Little Muddy Kids’ One-Mile Fun Run and a 2K-9 Fun Run for you and your dog. All courses wind through the beautiful George Mitchell Nature Preserve, located on 1,800 acres adjacent to Rob Fleming Park in the Village of Creekside Park. The festive post-race party includes live zydeco music, the Muddy Bowl Crawfish Cook-Off and children’s activities. Concessions will be available for purchase. Please Note: Muddy Trails Bash is not a mud run or adventure race. Browse the Event archive. Category: Spring - Woodlands. Tags: Community, Family Events, Festivals, Food, Fun. Bookmark the permalink. Both comments and trackbacks are currently closed.